With the Western Australian Government taking a fresh look at saltland management, it is worth revisiting some of the existing management options that provide returns for farmers and the environment. The study, based in Yealering 200 kilometres South East of Perth, divided an unimproved valley floor with a bund to create two catchments, each about 25 hectares. The treatment catchment was successfully planted in 2004 to a saltbush-based system, consisting of clovers and medics seeded at a rate of nine kilograms per hectare, and River Saltbush (Atriplex amnicola) and Old Man Saltbush (A. nummularia) planted at 660 stems per hectare. The saltbush-based system dramatically reduced the discharge of salt, nutrient and sediment, especially after 2006 when the saltbush was more mature. The amount of salt discharged in the treatment catchment was reduced to 12 per cent of the discharge recorded in the unimproved catchment, despite discharging more salt prior to saltbush establishment. The reduction in discharge was most likely caused by a drier surface profile and lower water table under the saltbush system, reducing the accumulation of salt near the surface. Also, the increased vegetation cover is likely to have slowed run-off, promoted infiltration and reduced the erosion of soil, salt and nutrients. Establishing a saltbush-based system is likely to lead to an increase in dry matter and the number of grazing days per hectare in the area planted, providing a return on investment while reducing the movement of salt into waterways. But could these outcomes be achieved by simply managing grazing on saline sites? According to makingmorefromsheep.com.au the typical low groundcover in saline areas is often due to overgrazing. Improving groundcover and productivity can simply be a case of fencing the area to control access by stock and allow volunteer pastures to establish. So is there a need for the saltbush component? 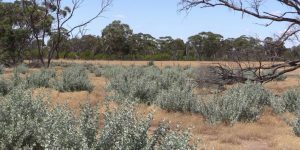 While saltbush is considered to have negligible hydrological impact at a catchment scale, the Yealering study suggests that the effect on the near-surface root zone may provide significant benefits at critical times of the year. For example, lowering the water table with perennial saltbush during dry months may help to leach salt down the profile and away from the soil surface early in the season, and reduce waterlogging in winter. This is likely to improve conditions for the germination and establishment of annual pasture plants in early winter. So there are certainly benefits to using saltbush, especially if the likelihood of successful establishment and production outcomes is high. The full report, Changes in run-off and groundwater under saltbush grazing systems: preliminary results of a paired catchment study, can be found at https://researchlibrary.agric.wa.gov.au/cgi/viewcontent.cgi?referer=https://www.google.com/&httpsredir=1&article=1351&context=rmtr or by searching “Yealering” and “saltbush”.